Sub types of seas:Forecaster, seas:Forecasting, and seas:Forecast, may constrain the type of the value of the property. For instance ontology seas:BooleanOntology may define seas:BooleanForecaster, seas:BooleanForecasting, and seas:BooleanForecast, that constrain the forecasted property to be a seas:BooleanProperty. A Forecast is the execution of some Forecasting process by some Forecaster. 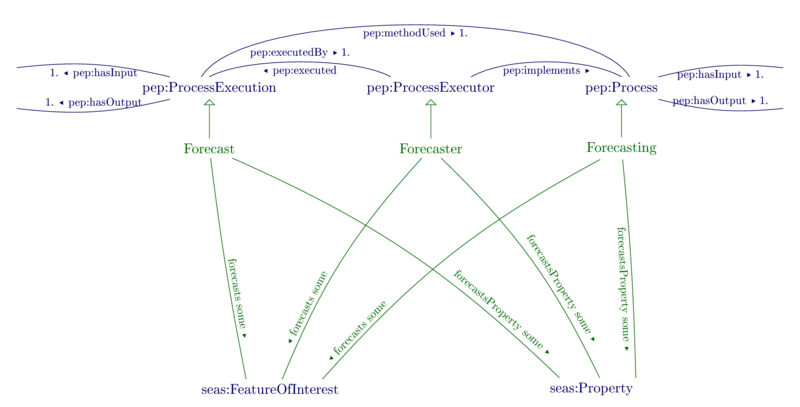 A Forecaster implements some Forecasting process, and may generate forecasts. Forecasting is the process of forecasting the state of a property. Links an Forecasting, Forecaster, or Forecast, to the feature of interest a property of which it forecasts. seas:forecastsProperty < seas:forecasts o seas:isPropertyOf . seas:forecasts < pep:methodUsed o seas:forecasts . seas:forecasts < pep:executedBy o seas:forecasts . Links an Forecasting, Forecaster, or Forecast, to the property it forecasts. seas:forecastsProperty < pep:implements o seas:forecastsProperty . seas:forecastsProperty < pep:methodUsed o seas:forecastsProperty . seas:forecastsProperty < pep:executedBy o seas:forecastsProperty .